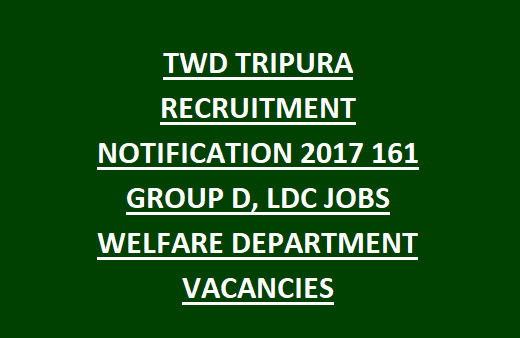 through the official website www.tripura.gov.in apply for Tripura Welfare Department LDC Jobs interested candidates should apply from 25-09-2017 to 20-10-2017 This Job Purely Temporary Basis. TWD Tripura Jobs eligible candidates should send their application by downloading the application form. The selection process for TWD Tripura Jobs will be based on the performance in the personal interview. For more information about the TWD Tripura Jobs, recruitment vacancies, age limit and education qualification go through the information given below. TWD Tripura Jobs Notification 2017 contains 161 jobs; detailed information will be given below. For the TWD Tripura Jobs 2017 Age limit will be between 18 to 45 Years, Age relaxation will be applicable for reserved candidates based on govt rules For more details go through Official Notification. TWD Tripura Jobs vacancies are based on writing test and Interview for more selection details go through the notification.